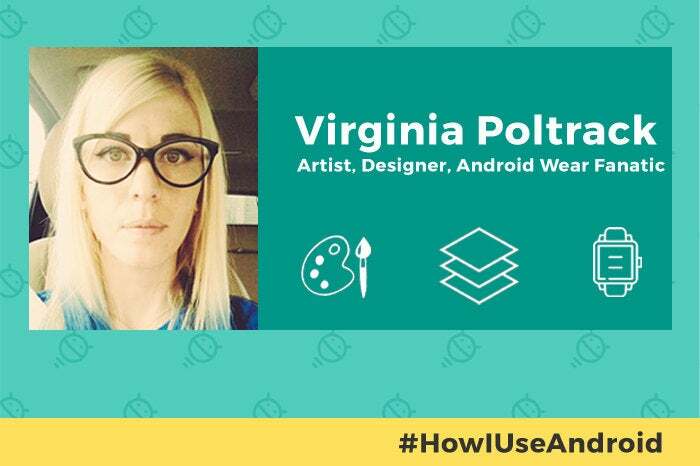 A prolific artist with all sorts of Googley endeavors shares the skinny on her own Android-using habits. 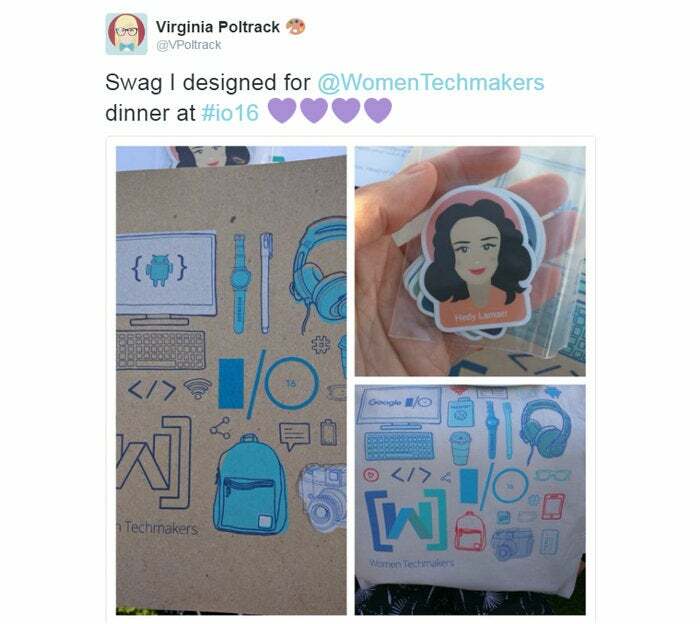 When I sat down to put this How I Use Android profile together, I realized something: It's really freakin' hard to sum up Virginia Poltrack's career in any succinct way. Virginia does a lot of stuff, much of it high profile and in the public eye -- but she doesn't have a traditional title, per se. Nor can her work be accurately described through any single one of her projects. 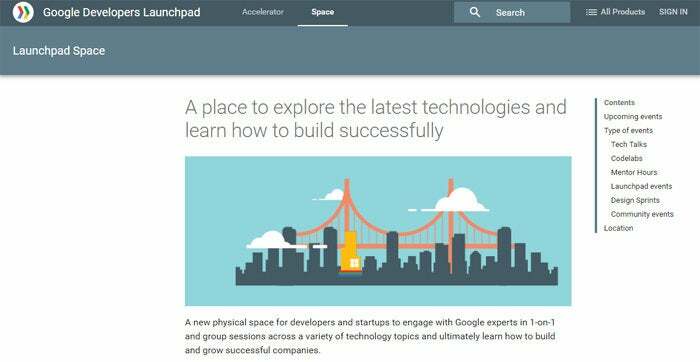 Virginia's working on some mysterious new Google projects right now, too, though she can't spill the beans just yet. (She promises we'll see the fruits of her labor eventually.) And Google and Android efforts aside, she keeps herself busy with assorted logo design work. She even found the time to create the illustrated profile picture of a certain stunning writer (who arguably looks much better as a result of that Material Design makeover). So, yeah: Virginia Poltrack is an artist. She's a designer. She has her hands in all sorts of things connected to Android. Her creative vision is slowly but surely making its way to more and more parts of the Google universe -- hell, let's just say the internet at large -- and making every corner it touches a little more colorful as a result. And, of course, she uses Android herself. Which gets us back to where we started. In her own words, this is how Virginia Poltrack uses Android. Your current primary phone: I'm using the "Really Blue" Pixel XL, which I am so stoked about. My old phone was the Nexus 6, which I also loved (what can I say, I like the big phones!). I've had the Pixel for about two months, and it's great! Your current tablet (if any): I use two tablets: a Nexus 9 and an iPad Pro that I use with the Apple Pencil for digital painting. Although I am firmly in the Android camp, I do have a few Apple products I use for specific tasks, and the iPad is a good example of that. I will add that I didn't install any social media or chat apps on the iPad; it's strictly for work, and as such, the apps I added were for design and painting -- which has worked out well. There are no distractions, and I find that very helpful! Your current smartwatch (if any): I LOVE ANDROID WEAR! Whew, now that I got that out: I currently have the women's model of the Huawei Watch (jeweled, which is lovely), and it's one of my most prized possessions. I love this watch. I find that it's quite responsive and works wonderfully, but I also really like that it looks good. I also have a few Mode bands that are ridiculously easy to use and add another layer of customization. A few years ago, I started my company, Fat Russell, and my intention was to focus on incorporating art and design into wearable devices. This technology is so personal; it's literally on us all the time, and I feel like we should be able to use it to help reflect our personalities. Android Wear is a perfect example of this. It allows for so much customization, from the actual watch (hardware) to the bands, to the faces, to the functionality (software). What face you're using on your watch right now: I'm currently using the "Heather" design from the Floral Watch Face pack we just released. I've been designing for Android Wear for a few years now, and I honestly love it. Every time I draw anything now, I think, "Oh, well, what would that look like as a watch face? LET'S TRY IT AND FIND OUT!" I also took the "Beginning Android Development" course on Udacity because I wanted to learn how to build my own watch faces. I feel a little bit like a mad scientist: I draw stuff, I get it on the computer, I open Android Studio, and I start fussing around and sending stuff to my watch. It's delightful. In a few short years, I went from never wearing a watch and having no idea what a smartwatch was to working on all these fun projects. I really love Android Wear! 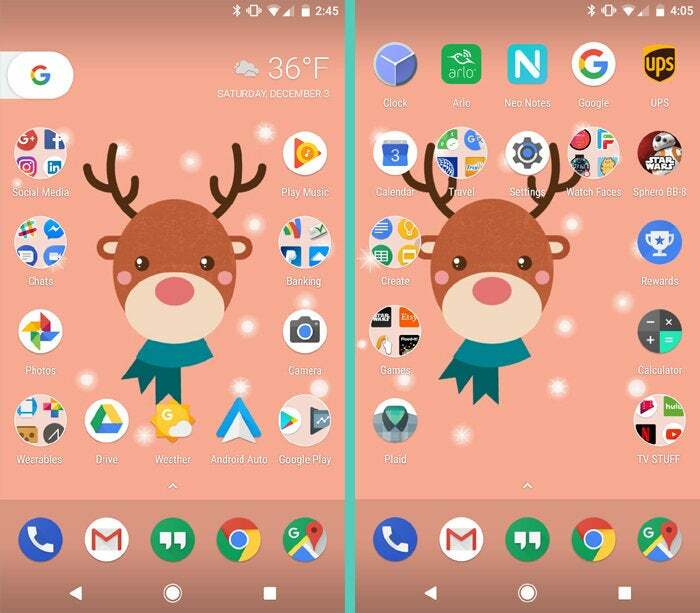 A quick walk-through of your phone's home screen setup: I only have two pages, and I keep the most-used apps on the front page. I try to keep everything organized by function: social media together, banking together, chats together, etc. I just installed Android Auto, so I'm excited to put that to use! It also cracks me up that I have a "Wearables" folder (Glass, Android Wear, Cardboard, Cardboard Camera), but it turns out I have a lot of wearable technology! What launcher you're using: I'm using the Pixel Launcher. I wanted to try out the stock launcher that came with the phone before installing anything else. 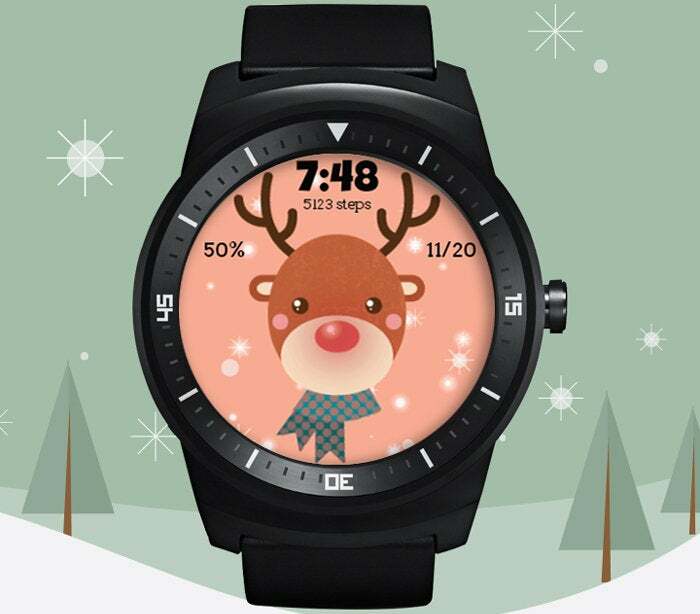 What wallpaper you're using: My current wallpaper is a little Rudolph illustration I made (shameless plug ahead) -- which is a free wallpaper available for anyone, and it is also a free watch face currently available in the Play Store. It's actually adorable, because we used the new step-count API -- so the more steps you take, the brighter his nose glows. Or, if you're like me and don't get many steps, you can tap the face to make the nose glow! Aside from the holidays, I either use a photo of San Francisco or Roman Nurik's Muzei live wallpaper app because, well, he's an amazing designer, and I love artwork. Win-win! Anything else of note (interesting customizations, special icons, etc): Honestly, I use everything stock. Might not be as exciting to some people, but it works for me! What's one of your favorite Android-related tips or tricks? I used to move images by sending them to my husband in Hangouts until he was traveling overseas with limited Wi-Fi and I totally clogged his phone with sketches from Fit Cat -- which he was not happy about. [Google Developer Advocate] Jenny Tong is the person who told me about Pushbullet, and it's been a life saver (and marriage saver?). And Fonty is a free app that allows you to make your own font (or use/buy other fonts) and then download the TTF file. I've been using it, and it's really fun! I am an art nerd who loves these things, but I figured it was worth a share! Icons in title image courtesy of Freepik and Madebyoliver at flaticon.com.